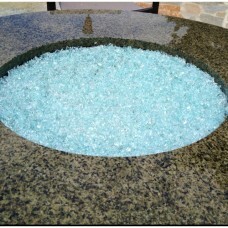 Our glass gravel chippings are produced from recycled materials and can be used in a variety of applications. The glass chippings reflect light in a mesmerising way that make them great for use in feature projects and displays such as water fountains and fireplaces. Although the glass is deemed safe, with no dangerous shards, it should still be used in enclosed environments or areas away from children and pets.